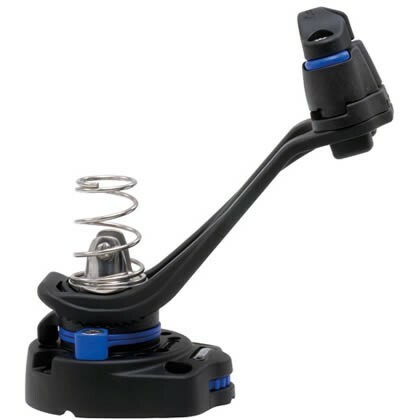 The deck swivel articulates to follow the movements of the trimmer. Used for main sheets on keelboats and smaller yachts. Can also be used on bigger boats if the purchase tackle is sufficient. The materials used are composite and stainless steel. Horizontal articulation - The angle of horizontal movement is easily adjusted without taking the swivel apart. Two stops can be fixed in 5 different positions, from a fixed arm to 300 degree angle of movement. Horizontal friction - The amount of friction for horizonttal movement is adjusted with a controlknob. The knob is located in a recess in order to prevent accidental adjustment, but is still easy to reach with a screwdriver or similar tool. Vertical articulation - This is easily adjusted from a flat horizontal lead to a steep 45 degree angle.